The stand hits the target enemy and pushes him back. Enemy will receive a bomb mark, and is detonated. A long-range attack that throws a straight bomb coin. The coin is then detonated. 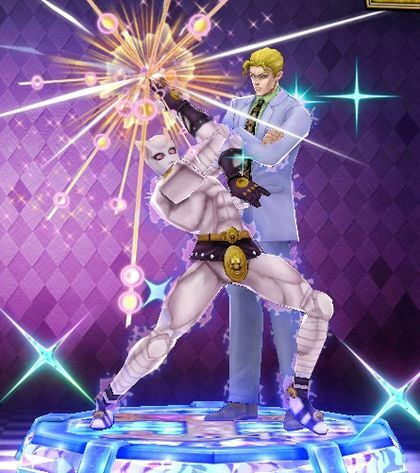 The Stand throws various punches and make the target explode. With this, i can sleep soundly tonight as well! Summons a Sheer Heart Attack that hits and explodes on nearby enemies. Summon a Sheer Heart Attack that attacks an enemy. The stand hits the target enemy and pushes him back. Enemy will receive a bomb mark. Using another explosion skill or change character will make the bomb mark disappear. A long-range attack that throws a straight bomb coin. Pressing the button again makes the coin explode and give DEF cut explosion damage. Using another explosion skill or change character will make the bomb coin disappear. The explosion causes DEF cut damage. Summon a Sheer Heart Attack that attacks enemies. You can't activate while using some skill. This page was last edited on 1 September 2018, at 13:32.